March 12, 2013: Three attorneys for Guantánamo detainees testified before the Inter-American Commission on Human Rights in Washington, arguing that indefinite detention and a harsh environment are creating conditions at the facility that amount to inhumane treatment. 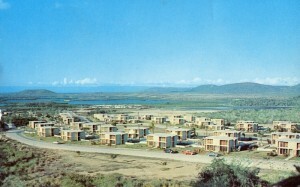 Military dependent housing at Guantánamo. Courtesy Deb Parsons. March 12, 1957: Three American teenage boys who ran away from their home on the base at Guantánamo were seen in Havana, Cuba––the center of increasing political violence––after joining the revolutionary forces of Fidel Castro.